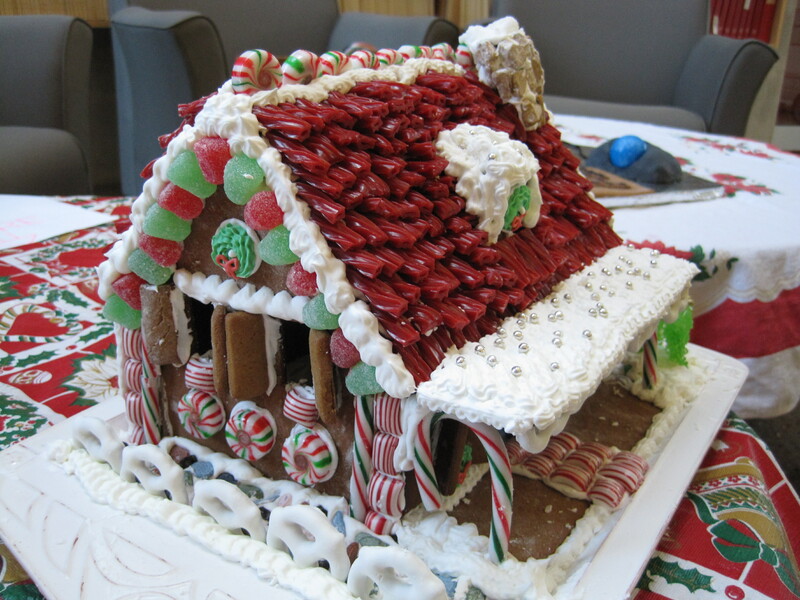 For our company’s gingerbread house decorating contest, I teamed up with my friends, Erin and Andrea. Thanks to Erin, who has a family tradition of making gingerbread houses, we won first place by most popular vote! I had such a great time making my first gingerbread house, so I’ve shared what I learned about how to make and decorate a gingerbread house. 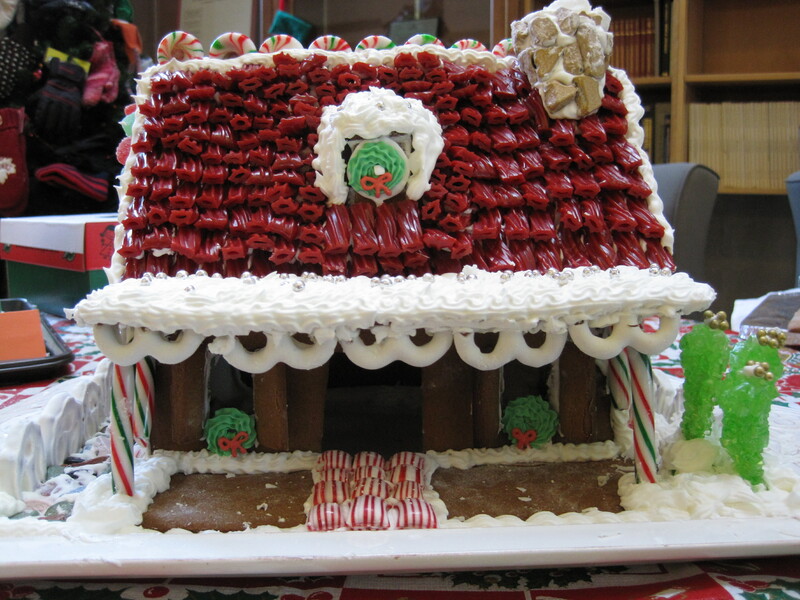 For some inspiration, see some amazing and elaborate gingerbread houses here. You could even use the guidelines provided below to make mini gingerbread houses as mug decorations (see here). Happy holidays everyone! Creating the template is the most time consuming and tedious step of this process, but it’s also the most important step. You can design your own gingerbread structure and create your own templates or you can google gingerbread house templates. For our gingerbread house, we used this template for a little country cottage. Although using regular printer paper to make your template works, I recommend using a stiffer type of paper or even thin cardboard. Draw and cut out a template for each piece of the gingerbread house. Measure and re-measure each piece! Don’t forget to label each template with 1. what part of the house it is for, and 2. how many of those pieces you will need. Cut out the windows and doors from the paper template so you will be able to trace them out of your gingerbread dough later. Once you have finished making your templates, you are ready to start making the gingerbread pieces. Use whichever gingerbread recipe you’d like, as long as it is firm and sturdy and can be rolled out thinly. We used a simple, standard recipe from Martha Stewart. Depending on the size of your gingerbread house, you may need several batches of dough. Work with one batch at a time. Roll the dough out to approximately 1/4 inch thick. Using a sharp paring knife, trace the template pieces into the dough and gently transfer them to a parchment paper or silicone mat lined baking sheet. Retain your paper templates until your gingerbread house is completely finished. Bake the gingerbread pieces in a preheated oven until cooked through. Allow them to cool slightly. Then, carefully trim the edges of the pieces with a large, sharp knife, so that they match your templates and so that the edges of your major pieces have straight, hard edges. This will make them easier to “glue” together. Allow the pieces to cool completely on a wire rack before assembling the house. When you are ready to assemble your gingerbread house, make the icing. When making a gingerbread house, you need an icing that will be stiff enough to easily glue your gingerbread pieces together. Unfortunately, this usually means that it doesn’t taste very good. This simple and quick, one-bowl recipe here worked perfectly. Depending on how you are decorating your gingerbread house, you may need more than one batch of icing. I recommend making them as you need them so that it doesn’t dry out on you. Use a piping bag and decorating tips for your icing. Match your templates to the gingerbread pieces so you know where each of the pieces needs to go. Start by assembling the walls and “gluing” them to your platter. Once the walls feel sturdy, you can add the roof. You may need to hold the roof for a couple of minutes until it settles and the house feels structurally sound. Additions such as dormers and chimneys, etc. should be assembled separately before being attached to the basic structure of the house. Allow the icing to dry completely at room temperature to ensure that all of the pieces hold together sturdily. Reattach any pieces with more icing as necessary. Now this is the real thing. How different from those kits sold in store (I never went past that simple stage) Am not surprised you won the prize with such a great work of art. That is so nice of you to say! Thank you! There was some Tough competition. Our IT department made a gingerbread computer with mouse, keyboard, and CPU with motherboard. I thought for sure we would lose to them! Not to burst your bubble, but those liquorice shingles aren’t going to help much when you get your first blizzard; the hollow centres let the icing sugar right in. You’d be better off using almond bark slate with a roofing-grade caramel adhesive. This is why it pays to use certified contractors with experience in the gumdrop kingdom. But I do have to commend you on the foundation – that chocolate rock masonry looks top notch when most houses go for cheap nougat. Thank you so much Hana! Have a terrific holiday!